The rally in financial markets continued through February as the key reasons for the rally were reaffirmed during the month. These reasons are better than expected guidance about future corporate earnings, positive news from U.S./China trade talks, and dovish comments from the Federal Reserve (Fed). On the trade front, investors heard several reports about productive talks between the U.S. and China and that a draft of an agreement was in progress. The move by President Trump to indefinitely delay the tariff increase scheduled for March 1 due to the level of progress being made in the negotiations provided a major boost to investor sentiment and risk asset prices. The uptrend in stock prices was further supported by comments throughout the month by several Fed officials confirming the “patient” approach to future rate hikes and the likelihood that the Fed could soon end its moves to reduce the amount of bonds on its balance sheet. The positive trade and Fed news overshadowed certain reports of slowing global economic growth. On top of the list of weaker economic data are the latest readings on manufacturing activity. Manufacturing activity has slowed around much of the world due to trade tensions, growth concerns, regulatory issues, and seasonal factors. Purchasing Managers’ Index data showed Europe’s manufacturing index dropped to 49.2, which is the first reading in contractionary territory (below 50) since 2013. Australia and Japan also dropped below 50. China’s index declined again dropping to 49.2, which is the lowest since March 2016. Another noteworthy sign of slowing economic growth was that the European Union cut its estimate for 2019 gross domestic product (GDP) growth to 1.3% from 1.9% citing weak global trade, the slowdown in China, and the uncertainty surrounding Brexit as the reasons for the cut. Not all economic news was weak. The manufacturing index in the U.S. rebounded to 56.6 and remains well into expansion territory. Service sector activity continues to be in expansion territory with index readings in most countries above 50. Fourth quarter U.S. GDP growth came in above expectations at 2.6%. For the year 2018, GDP grew at 2.9%, which was up from 2.2% in 2017. In the U.S. equity market, the S&P 500 index had a return of 3.2% with mid and small size stocks gaining more. With the sharp rally so far in 2019, the S&P 500 index is up almost 16% since the December 2018 low and the Russell 2000 index of small-capitalization (cap) stocks is up about 22% since the low. 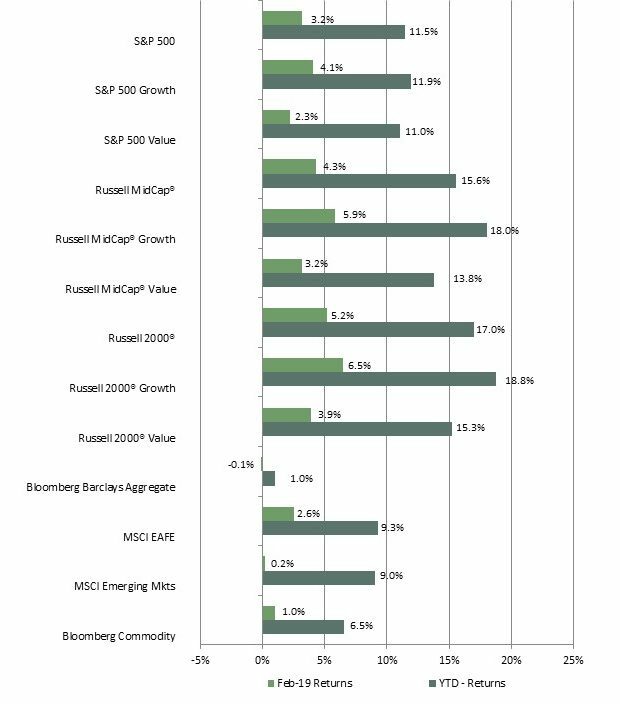 In February, growth stocks outperformed value stocks in each market cap category. Except for strong returns for the information technology sectors in the large, mid, and small-cap indices due to better than expected earnings, sector performance varied by market cap. In the large-cap index, industrials was a top performing sector on U.S./China trade optimism. Communications services was one of the weakest performing sectors on disappointing earnings reports from video gaming companies. In the mid and small-cap indices, communications services was one of the top performing sectors while energy and consumer staples had the lowest returns. In foreign equity markets, the MSCI EAFE index of developed market stocks outperformed the MSCI Emerging Markets index (EM). Currency had a negative impact on returns for U.S. investors for both the EAFE and EM index. Growth stocks outperformed value stocks in both the EAFE and EM index. On a geographic basis, Latin America was particularly weak with Brazil and Mexico posting some of the largest declines due to political issues. Japan was the weakest performing developed economy hurt by slowing economic activity and renewed concerns about the low rate of inflation. China had one of the largest gains boosted by U.S./China trade optimism, loosening of liquidity and credit policies, and higher investor cash flows due to the increased weighting of Chinese stocks in a widely followed index. Despite the upcoming Brexit deadline at the end of the month and no firm agreement, equities in the United Kingdom posted a solid advance in February. U.S. bond market returns were mixed in February. Corporate bonds generally outperformed Treasury bonds as the corporate bond rally continued from January along with the equity rally. The high yield bond index had the best return. In the Treasury bond market, yields were little changed. At month-end, yields on Treasury bonds with maturities from six-months out to five-years were about 2.5%. The 10-year Treasury bond yield was 2.7% and the 30-year bond yield was 3.1%. The Bloomberg Commodity index had a return of 1.0% for February. The petroleum sub-index was the top performing sector gaining almost 8% for the month. Oil prices rose in February due to rising Chinese imports and supply cutbacks by Russia and the Organizations of Petroleum Exporting Countries (OPEC). The industrial metals sub-index also had a strong return on improving sentiment about economic growth due to China’s stimulus actions and positive reports about U.S./China trade talks. The precious metals sub-index had a small negative return as both gold and silver prices moved lower. The agriculture sub-index also posted a negative return due primarily to much lower grain prices due to high inventory levels. Our tactical allocation recommendations include an equal weight to U.S. large-cap, mid-cap, and small-cap stocks and to developed international equities. We recommend an overweight to emerging markets equities due to favorable relative valuations and growth potential. Within our equal weight fixed income recommendation, we continue to favor short to intermediate maturities. We continue to recommend an underweight allocation to hedge funds. Since our expectation is for a moderate rate of inflation, we recommend an equal weight to real assets. We continue to recommend an overweight to cash reserves that includes adequate cash to support spending needs over the coming 12-24 months since we expect financial markets to continue to experience bouts of heightened volatility.